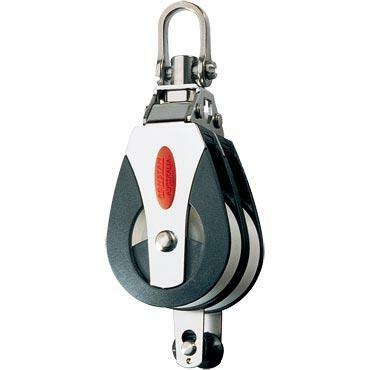 Series 40mm All Purpose Blocks Double, Becket, 2-Axis Shackle Head. Exceptionally high working loads. Low maintenance, long service life. Self-lubricating sheave. Slotted pin shackle eliminates fouled lines. Two way head post. Snap fit removable becket pin. Sheave 40 mm. Max. Rope 10 mm. M.W.L. 600 kg. B. L. 1200 kg. Weight 143 g.